A late lunch and a quick sandwich have conspired to give me enough time to blog. 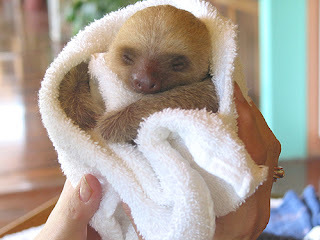 Sloth - not necessarily the one pictured above -- it what I am aspiring to this week-end. Last week-end I was impressively (ridiculously?) productive so this week-end I need to balance things out. So this week-end it's all about the sloth. I don't know if I'll manage to be quite as cute as the little sloth above, but a girl can try. Looks like he or she has the right idea -- start with a long bath and very fluffy towel. It's going to be a great week-end. We're all lined-up to break a record for rain this week-end. Scary stuff when you consider how much rain is 'normal' for this part of the world. With floods on the way the last two week-ends it seemed the only logical thing to do was to go out and play in it. A large puddle was making its way across the driveway and I was thinking it was big enough for ducks. Turns out it was. This is a first attempt at video, edited together in Windows MovieMaker. The original clips were shot at 5 MGP and are crisp during editing, but it keeps rendering pixelated. I've adjusted every output setting I can find. The best advice I've had so far on sharpening it up was "buy a Mac". If anyone has advice with a smaller price tag (or wants to buy me a Mac) I'm all ears. There's an earlier version of the same idea here, but this was accidentally shot at 3 MGP so it's even fuzzier. Sometimes it is really nice to do a task the slow way. Recently I came across a copy of Meaghan Mountford's new book, Cookie Sensations. It is a little over a hundred pages of everything from icing the Eiffel tower to Elvis onto a cookie. I decided to start with an easy one -- daisies. 1. You can dye icing white. This came as a total shock to me. I thought that the only way et get white icing was to use Royal Icing which is beautiful but not very tasty. Turns out Wilton makes white food colouring. And it works. 2. If you think your icing is too thick it probably is. I suffered through about a half dozen cookies before emptying out the icing bag and thinning it a bit. What blessed relief. 3. If you're piping a simple outline, skip the #3 and use a #4 tip instead. Also about six cookies into the day I realized that if I was only doing loopy daisy outlines it was going to go a LOT faster with a slightly larger tip. I wish I had realized this before filling in all the yellow centres with a #3. Good grief, it's not THAT had to change tips! All in all they came out not too shaby. One thing to keep in mind is that you always need colours in pairs -- one to outline and a lighter version to fill. So these cookies in three shades required six colours of icing (would have been seven but white outlines white just fine.) All that to say do yourself a favour and buy multiple #4 & #6's so you're not constantly washing out tips. And to whoever it was who invented the disposable icing bag, I salute you. Ever heard of beatbox flute? Until today around lunchtime, neither had I. But thanks to the wonder that is YouTube my world got a little bigger. This is Greg Pattillo and as you'll see in the vid he's not just an amazing flautist but he beatboxes as he's playing. No tricks, no editing. Just an amazing display of a skill that probably won't beef up your resume but it's pretty sweet. Take a deep breath and listen in.